The Rangers lost a Game 7 at Madison Square Garden for the first time in history, coming just 20 minutes short of a trip to the Stanley Cup Finals. Photo courtesy of MSG Photos. For the first time in franchise history, the Rangers lost a Game 7 on home ice, getting shutout by the Tampa Bay Lightning as they continue their quest for the Stanley Cup, and the Rangers go home for the summer. Prior to tonight, New York was 7-0 in Game 7s played at Madison Square Garden. They earned the right to play tonight’s game on home ice by winning the President’s Trophy in the regular season. But that effectively went to waste, as the Rangers lost three of four games on home ice, and were shut out in Game 5 and 7. They scored just four goals at the Garden in this series. The loss also snapped a 10 game win streak at Madison Square Garden in elimination games for the Rangers, as well as a six game win streak in Game 7s. Perhaps the man that should be most disappointed is Henrik Lundqvist, who was the only player dressed in blue that performed at the top of his ability. Lundqvist made 23 saves on 25 shots, including some truly spectacular stops throughout the game to keep his teammates alive. Unfortunately, he had to sit there and watch an anemic offense perform in front of him for 60 minutes. 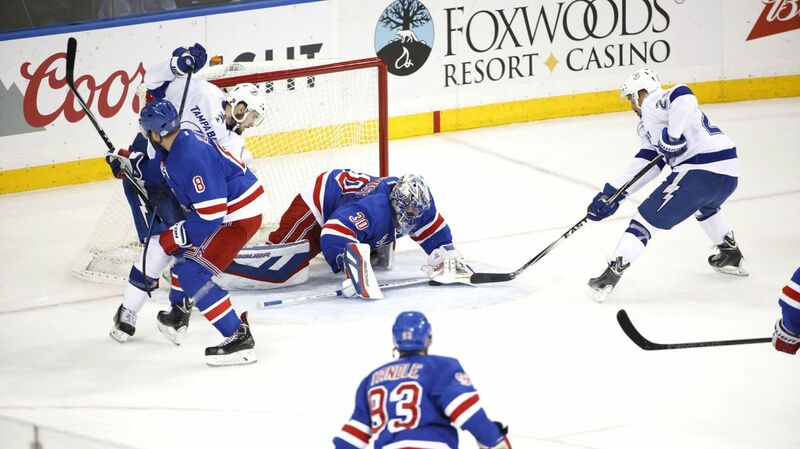 Henrik Lundqvist was spectacular again in Game 7, making some truly astounding saves to keep the Rangers afloat. But the offense could not pick him up. Photo courtesy of MSG Photos. It was the first time in his career that he had allowed more than one goal in a Game 7. Again, it didn’t matter, because his teammates couldn’t score. He finishes the playoffs with an 11-8-1 record, a .928 save percentage, and a 2.11 GAA. It was one of his best playoff performances of his career, and Lundqvist has a lot to be proud of. Lightning head coach Jon Cooper was right when he was interviewed in the second period, saying that this game was “eerily similar to Game 5.” The Lightning were very sound defensively, completely limiting anything the Rangers did, and took advantage of the light pressure, capitalizing on two chances and coming away with a 2-0 victory. The Rangers seemed to make absolutely no adjustments from that game. There was no traffic, not a lot of shots, and maybe three high quality chances. It was a disappointing effort from a forward group that scored seven goals in Game 6. The power play was 0-2, which really hurt the Rangers, and they mustered 11 shots on goal in the first 40 minutes, and just 22 in the game. It’s crazy to think that the second best offense in the Eastern Conference during the regular season was the biggest problem for the Rangers in the playoffs. Credit has to go to the Lightning. Their defensive game was flawless, totally pushing the Rangers around, allowing Bishop to see every shot and give him what was overall a pretty easy night. It hurts to say it but they deserved the win tonight. The Rangers never really challenged and Tampa dictated play the entire night. Alain Vigneault actually decided to dress seven defensemen for this game, putting Matt Hunwick in the lineup and scratching James Sheppard, who scored the game winning goal in Game 6. Ryan McDonagh had not skated for a while, and it was primarily a precautionary issue. McDonagh did not play for the first 13 minutes in the period, and headed to the dressing room, but came back and played 17:33 of ice time. It was announced after the loss that McDonagh had played the last few games with a broken foot. He has the heart of a warrior, and a captain, and it didn’t seem to slow him down in those games. But I do have an issue with dressing seven defensemen. Either scratch McDonagh, or play your seven defensemen. Vigneault wasted a roster spot so Hunwick could play for 4:17 in the first period, and then benched him for the rest of the game. Tanner Glass also played just 5:53 in the game. So effectively, Vigneault limited the bench to 10 forwards. If you’re going to dress a guy, utilize him. It was a foolish decision that was detrimental to the Rangers. Tampa outshot the Rangers 9-5 in the first period, and had their best chances stopped by Lundqvist. At 12:17, Lundqvist made a magnificent save, deflecting a puck just over the crossbar after it changed directions off of a skater. Then at 16:47, he made a great pad save on Valteri Filppula’s redirection of Ondrej Sustr’s shot. In the second period, it was the same story, with the Lightning outshooting the Rangers 10-6, and forcing Lundqvist to make some more great saves. Early in the period, he kicked out the right pad to stop Nikita Kucherov in tight. At 16:04, Lundqvist denied a high rising shot from Jason Garrison, using his arm and glove to stop that shot. Perhaps his best save of the night came later in the period. Kucherov set up Tyler Johnson from behind the net, giving him a one-timer opportunity from just a few feet out. 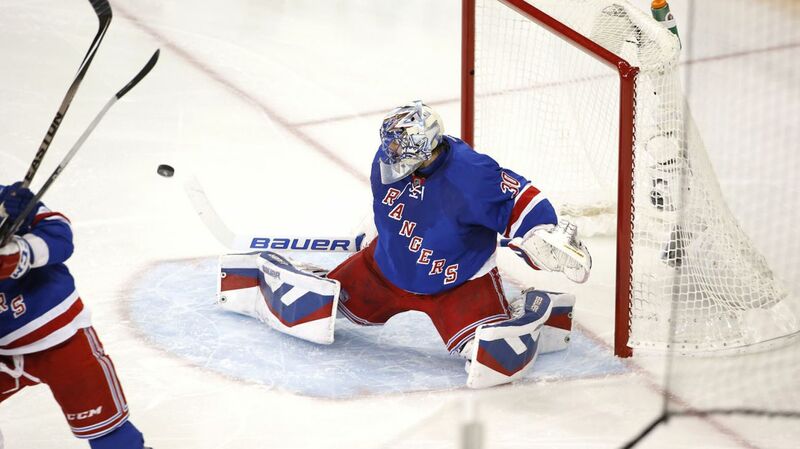 But Lundqvist flashed the right pad to stop the puck from going into the back of the net. The Rangers had the only two power plays in this period, and managed just two shots in those four minutes. Those failed power plays loomed over the Rangers throughout the game, especially with the fact that the Rangers really didn’t have any memorable chances that they could have scored on, even when they net was empty for almost four minutes. Just 1:54 into the third period, Alex Killorn scored the opening goal, taking the air out of Madison Square Garden and out of the Rangers. Lundqvist was screened by his own man and a Lightning forward, and Killorn’s backhand trickled through the pads of Henrik Lundqvist. At 11:17, the Lightning doubled their lead when Ondrej Palat scored off of the rush, firing a wrist shot over the glove of Lundqvist for a two goal lead. At that point, it really seemed like there was no life left in the team or the stadium at that point. The Rangers pulled Lundqvist with 3:45 remaining in the third period, but didn’t manage a ton of pressure at all. The Lightning killed off the last minute or so, and the Rangers season came to an end. It was a really disappointing way to go out. For the second consecutive home game, they couldn’t muster a goal, and a talented group left the playoffs way too early. This was one of their best chances to win the Stanley Cup again, and unfortunately it did not work out. Posted on May 30, 2015, in Game Recaps and tagged Alain Vigneault, Ben Bishop, Cam Talbot, Carl Hagelin, Chris Kreider, Dan Boyle, Dan Girardi, Derek Stepan, Derick Brassard, Dominic Moore, Hartford Wolf Pack, Henrik Lundqvist, James Sheppard, Jesper Fast, JT Miller, Keith Yandle, Kevin Hayes, Kevin Klein, King Henrik, Madison Square Garden, Marc Staal, Martin St. Louis, Mats Zuccarello, Matt Hunwick, MSG, MSL, New York Rangers, NHL, NHL 2014-2015 Season, NHL Playoffs, NY Rangers, NYR, Rangers, Rangers Nation, Rangerstown, Rick Nash, Ryan Bourque, Ryan McDonagh, Stanley Cup Playoffs, Steven Stamkos, Tampa Bay Lightning, Tanner Glass, The Ranger Zone, Tyler Johnson. Bookmark the permalink. Leave a comment.